Desu Ransomware is not an ordinary infection. It is not even an ordinary ransomware. Instead of just encrypting files and making a demand for a decryptor that could, allegedly restore files, it also encrypts the master boot record. If the MBR is encrypted successfully, there is no way of booting the Windows operating system in a normal manner. Using this obstacle, instead of giving you access to your system, the infection displays a ransom note that, of course, instructs to pay a ransom. At this moment, unfortunately, it is not possible to decrypt files manually even if you remove the infection, and the promises made by cyber criminals are unlikely to be truthful. In fact, our research team strongly recommends against paying the ransom because that would, most likely, be a waste of money. So, what are you supposed to do when this malware strikes? You might be thinking about the recovery of your files first, but, in fact, you should be thinking about the removal of Desu Ransomware. Even though this action cannot restore files, it is something you want to do ASAP. Did you execute Desu Ransomware by accident when you opened a suspicious spam email attachment? Maybe the threat got in using an entirely different path? Whatever the case might be, if you do not delete the infection right away, it moves on to encrypt data. According to our research team, the ransomware can employ TEA (Tiny Encryption Algorithm) or XTEA (Extended Tiny Encryption Algorithm) encryption to corrupt the files that are stored on your operating system. Documents, personal photos, media files, archives, and similar content is likely to be encrypted, and when that happens, the unique “.desu” extension should be added to the names. Of course, you will not notice this if Desu Ransomware encrypts MBR. 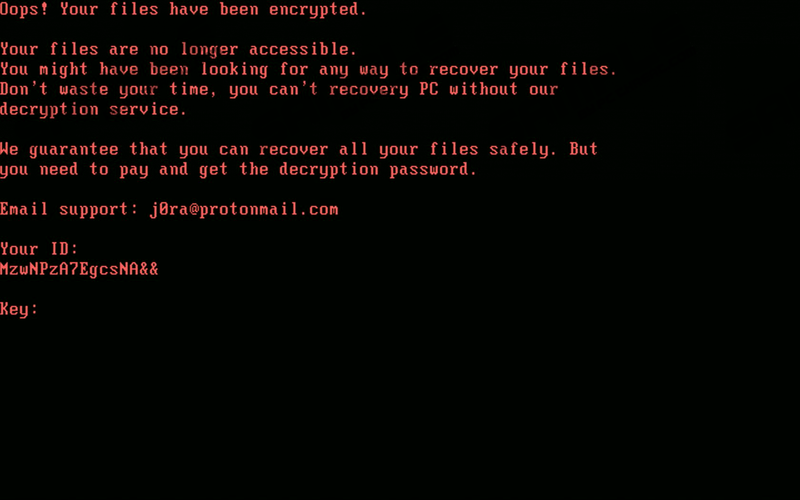 Once that is done, the infection restarts the computer, and instead of rebooting the operating system, the ransom note is shown. This is when you are likely to realize that malware has invaded your system, and, of course, it is too late to do anything. The ransom note is represented in red on black, and the message is the same as you would find in @_DECRYPT_@.txt, @_DECRYPT2_@.txt, and @_DECRYPT3_@.txt files. The TXT files created on your operating system, and the ransom message introduced to you as your computer restarts inform that you need to pay a ransom of 200 USD. According to the message, if you transfer this sum in Bitcoins to the 1ARDXRQsvnsYiM5jZczFagtCrAzSFC1Qmy Bitcoin wallet and then send a message to j0ra@protonmail.com, you should receive a private key. Would you? Highly unlikely. Of course, if you want to take the risk, you are likely to take it no matter what we say, but remember that you should not get your hopes up. Unfortunately, there’s nothing else we can do to help you with the recovery of personal files. In fact, it appears that you can recover them only if backups exist. You will not be able to restore files from backup if it is internal because the ransomware deletes shadow volume copies when it invades the operating system. There are plenty of infections capable of doing that, which is why we always recommend setting up backups externally and/or online. If you have backups, the removal of the malicious Desu Ransomware is the only thing you need to think about. Just like MBRlock Ransomware, Uselessdisk Ransomware, Annabelle Ransomware, and other malicious infections, Desu Ransomware encrypts MBR, and that means that you have to repair it. You can do that using the Windows installation CD/DVD, and, hopefully, the instructions you can find below will help you with the process. Of course, it is not enough to repair MBR. You also need to delete Desu Ransomware components, and this process is represented in the guide as well. Not all users will be able to erase the malicious threat themselves, and that is okay because anti-malware software can handle the removal of malware automatically. Not only that, it also can help you protect your operating system, and that is why we strongly advise that every Windows user installs it. If you need advice on which anti-malware software to install, or you want to ask questions about the ransomware, do not hesitate to communicate with us using the comments section. Insert the Windows Recovery CD/DVD and restart the PC. Choose Boot Windows with CD-ROM Drive and pick parameters. Click Next. Click Repair your computer and then go to Troubleshoot. Once repair is finished, eject the disk, and enter exit into the prompt. Click Repair your computer and then go to System Recovery Options. Choose Boot Windows with CD-ROM Drive and then tap R on the Welcome to Setup menu. Enter 1 on the Recovery Console menu to select Windows. Enter fixmbr to repair the MBR. Find and Delete the malicious executable (.exe file) that launched the ransomware. Empty Recycle Bin to eliminate the infection and its components. Install a legitimate malware scanner to perform a full system scan and check if the system is now clean. Quick & tested solution for Desu Ransomware removal.